One of the greatest joys we can have as Christians is the joy of leading others to Christ. 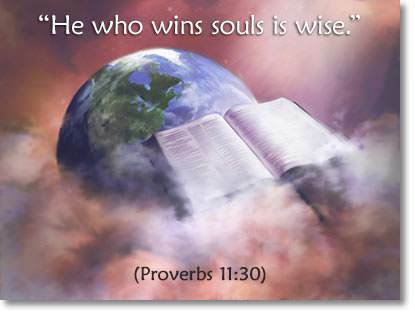 The Bible says, "…he that wins souls is wise" (Proverbs 11:30). Think of it! You and I can be God's instruments for winning our friends, relatives, and others to Christ. 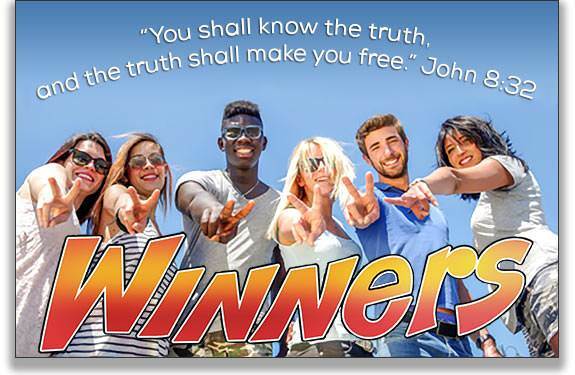 Why is it so important to learn how to win others to Christ? Because of the value of a human soul. God values the souls of men so highly that He sent His Son to die on the cross that men might be saved. When we see how precious every person is to God, we will do all we can to win them to Christ. Always remember that every person will live forever—either in the blessings of Heaven or in the unspeakable miseries of hell. We must use God's Word. "Being born again, not of corruptible seed [man's words], but of incorruptible [seed], by the word of God, which lives and abides forever" (1 Peter 1:23). Are you reading your Bible daily? 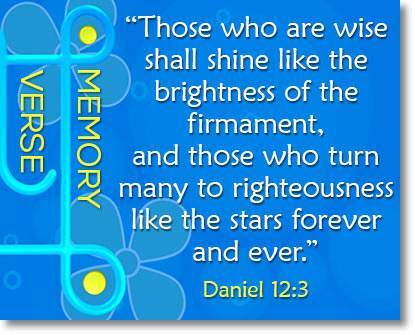 Are you memorizing Scripture? Have you established a daily Quiet Time with the Lord? Do not neglect these things if you want to win souls. We must depend on the Holy Spirit. It is the Holy Spirit who convicts people of sin; it is the Holy Spirit who shows people their need of the Savior; and it is the Holy Spirit who reveals Christ to them. Ask God to fill you with the Holy Spirit so you can be an effective soul-winner. We must give people the gospel. The Lord has commanded every believer to have a part in preaching the gospel to every person. 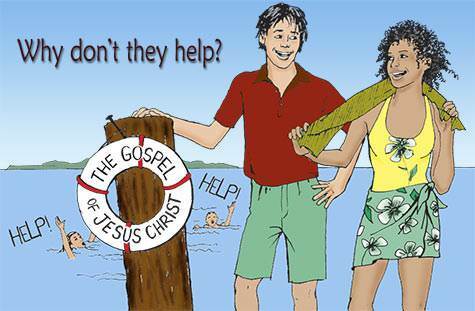 People are saved by believing the gospel. "Moreover, brethren, I declare unto you the gospel…how that Christ died for our sins according to the Scriptures; and that He was buried, and that He rose again the third day according to the Scriptures" (1 Corinthians 15:1,3-4). 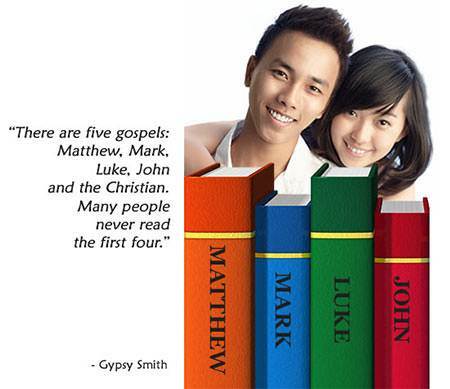 There are four basic truths in the gospel message. Study them carefully. 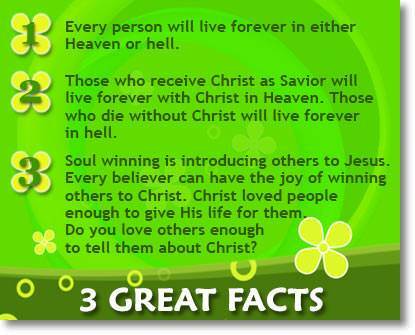 Get these four facts firmly fixed in your mind because you will use them in leading souls to Christ. How to lead a person to Christ. Be sure that he sees from God's Word that he is a sinner. Explain to him that the punishment for sin is "death." Find Romans 6:23 and have him read this. This death means being separated from God forever, in the lake of fire. Find John 3:16 and ask him to read this out loud. Ask, "What does this verse say to you?" Ask, "Who does it mean when it says the world?" It means all the people in the world. Ask, "Who does it mean when it says whoever?" It means anyone. That includes you and me! Ask him to read the verse again with his name where it says "the world" and "whoever." For God so loved_________ that He gave His only begotten Son, that _________ believing in Him should not perish, but have everlasting life. What is God's gift to us? His gift to us is His Son. God gave His Son Jesus to die on the cross for our sins. Because He loves us so much, God gave His Son Jesus to us to be our Savior. Find John 1:12. Ask him to read this out loud. Ask, "What does this verse say to you?" Explain that you become a child of God by receiving the Lord Jesus as your Savior. God has given Him to you, but you must receive Him. Now you can ask these questions: "Do you know that you are a sinner? Do you believe that Jesus Christ is the Son of God? Do you believe that He died on the cross for your sins and rose again? Do you believe that Jesus wants to save you? Do you believe that He would come into your heart right now and save you if you asked Him to? 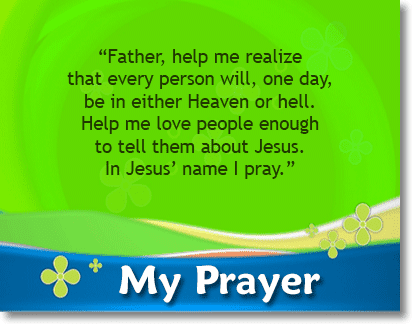 Are you ready to invite the Lord Jesus into your heart?" When you ask this last question, be silent. Pray silently for the person. The Holy Spirit is the One who shows us our need of Christ. Let the Holy Spirit do His work as you pray. When the person says that he is ready to invite the Lord Jesus into his heart, you may guide him through a prayer. Pray one sentence at a time, and let him repeat after you. Turn to John 3:36 and ask him to read this out loud. Ask, "What does this say to you?" Ask, "What are the two groups God is talking about in this verse?" The answer: Those who believe on the Son and those who do not believe on Him. Ask, "Which group are you in now?" Answer: The group which believes on the Son. Ask, "If you are in the group which believes on God's Son, what does God say about you?" The answer you want is: "God says that I have everlasting life." Ask, "How do you know?" The answer you want to hear is, "I know because God says so!" How can a person know he is saved? He can know 1) by believing God's Word, and 2) by the witness of the Holy Spirit. A good verse for assurance is 1 John 5:13. Look this up in the Bible and have the person read it. "These things have I written unto you that believe on the name of the Son of God; that you may know that you have eternal life, and that you may believe on the name of the Son of God." You may be a new Christian, and you are wondering what you can do. You can serve the Lord now! You can tell others what Christ has done for you. You can ask, "Has anyone ever shown you from God's Word how you can know that you are going to Heaven when you die?" You can get children and teens enrolled in these online lessons. Give special attention to children! 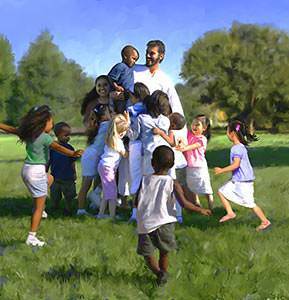 "Let the little children come to me, and do not forbid them; for of such is the kingdom of God" (Mark 10:14). "Except you be converted, and become as little children, you shall not enter into the kingdom of heaven" (Matthew 18:3). Children's hearts are naturally open to God. They are honest and sincere. They readily admit their sins. They are deeply touched by God's love in giving His Son to die for their sins. How old does a child have to be in order to be saved? Old enough to know that he has said and done wrong things. If a child is old enough to know that, he needs a Savior. How do you lead a child to Christ? 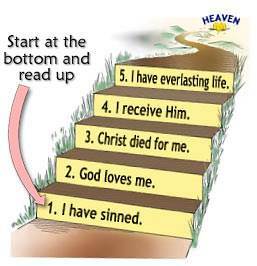 Simply show him the Five Steps in this lesson and ask him if he would like to invite Jesus into his heart. There are two great joys awaiting the person who lives for Christ. The first great joy will be to see our precious Savior face to face and to hear Him say, "Well done, good and faithful servant! Enter into the joy of your Lord." 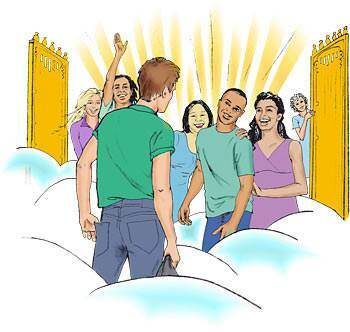 The second great joy will be to meet those whom we have introduced to the Lord Jesus Christ. "Hey, it was YOU who invited me here!" Three teens who defied a king! David's kingdom had lasted over four hundred years, but now Jerusalem was captured by the Babylonian king Nebuchadnezzar. He allowed the temple and the city to stand, but he took some of the choice young men from the royal family and nobility back to Babylon as captives. These teenagers were prisoners of war, but they were given special treatment. 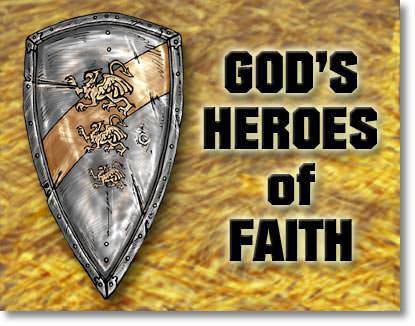 The Bible tells about three of these young men who defied the king—Shadrach, Meshach, and Abednego. Nebuchadnezzar was a proud and vain king. He loved things that called attention to himself. He constructed a ninety-foot gold statue in his likeness. Then he gathered all the public officials for a dedication of the statue. 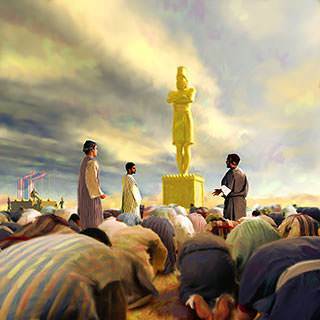 Nebuchadnezzar announced that at the sound of the music, everyone must fall down and worship this image of gold. Anyone who disobeyed would be thrown into a blazing, fiery furnace. When the music sounded, everyone fell down and worshiped the image, except Shadrach, Meshach, and Abednego. This was reported to the king and he blew up in a fit of rage. He called the three young men before him and demanded an explanation. "…our God whom we serve is able to deliver us from the burning, fiery furnace…But if not, let it be known to you, O king, that we will not serve your gods, nor worship the golden image which you have set up" (Daniel 3:17-18). King Nebuchadnezzar exploded with anger! He ordered that the furnace be heated seven times hotter. Then he ordered his most mighty men to bind Shadrach, Meshach, and Abednego, and cast them into the burning, fiery furnace. A few minutes later, Nebuchadnezzar peered into the blazing, fiery furnace. He was shocked at what he saw. He said to his counselors, "Did not we cast three men bound into the midst of the fire?" They said, "True, O king." "Look! 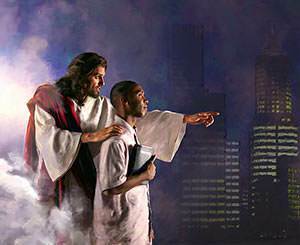 I see four men loose, walking in the midst of the fire, and they have no hurt; and the form of the fourth is like the Son of God" (Daniel 3:25). Then Nebuchadnezzar came near to the door of the burning, fiery furnace and said, "Shadrach, Meshach, and Abednego, you servants of the most high God, come forth." 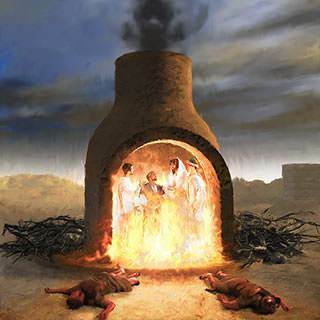 Then Shadrach, Meshach, and Abednego, came out of the fire. Not a hair of their heads was singed, their clothes were not burned, and there was not even the smell of smoke about them. Then Nebuchadnezzar said, "Blessed be the God of Shadrach, Meshach, and Abednego, who has sent His angel, and delivered His servants who trusted in Him." The king promoted Shadrach, Meshach, and Abednego to high places in his kingdom and decreed that no one speak a word against their God. The lesson for us is this: God honors those who honor Him.